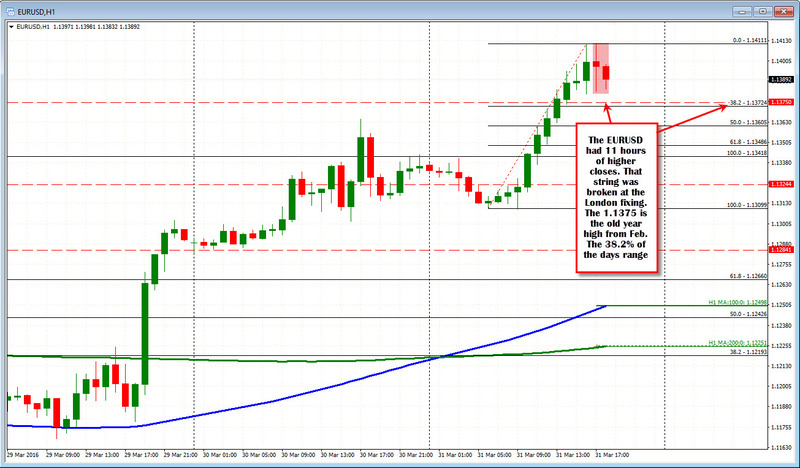 The EURUSD has rolled over a bit after the fixing. The pair is working toward the final ticks of the calendar month now. The US Employment report will become the main focus. 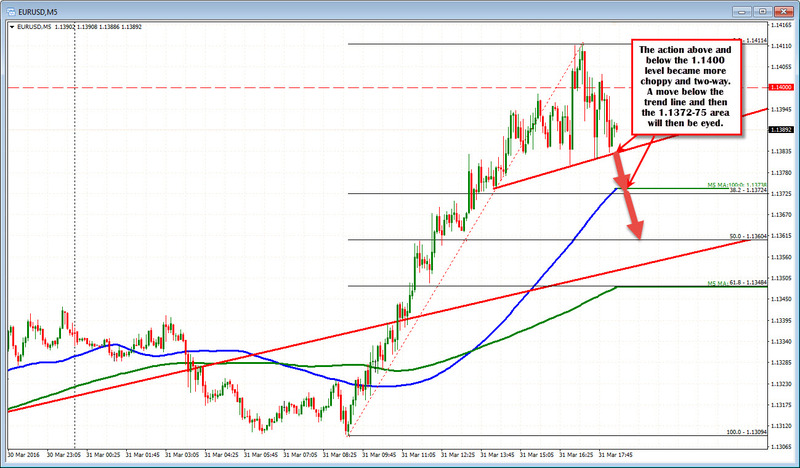 The expectation is for the NFP to add 205k and the unemployment rate to remain steady at 4.9%. The hourly earnings may very well get the most attention after last months surprising -0.1% decline. It is expected to rise by 0.2%. I guess, month end/quarter end is not officially over until 5 PM ET and I do not expect liquidity conditions to be that normal. So anything can happen, but the peek above the 1.1400 level could not muster the buyers to take the price up to the 1.1435 target (see prior post). Having said that, there is a trend line on the 5 minute chart below that is at 1.1383 currently and the 1.13757 high from February (the old year high) should attract some buyers just because...The 100 bar MA (blue line) on the 5 minute chart is also near that level currently. So as always, when the price moves higher like it has today, the corrections have to get through the wake it left behind. Traders who are looking for the back fill, would probably prefer that the 1.1400 level is kept at a distance now. PS the EURGBP which was helping earlier has also turned lower in the last hour or so of trading.